Editor's note: Randall Grahm's piece, which has been updated and revised for my site, was originally commissioned in 2010 for the Hearth and Terroir wine lists in NYC, where the restaurateur and sommelier Paul Grieco invited various "Terroirists" to write about their favorite Rieslings. 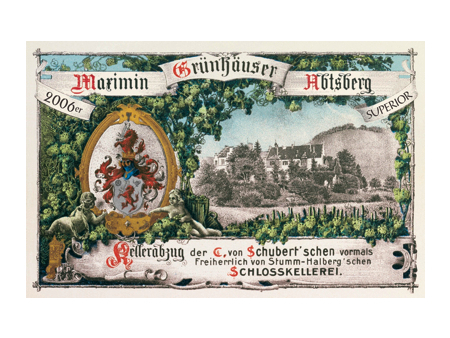 In addition, Randall's now 11-year-old daughter, Amélie, included her own tasting impressions of this wine from one of our favorite producers: Carl von Schubert, proprietor of Maximin Grünhaus. Here is what is interesting: I didn’t get this first-hand from Carl, and probably it is very indiscreet and irresponsible of me to be bruiting about hearsay testimony, but hey, this is not a court of law. I have it on reasonably good authority that when he was in San Francisco not too long ago, Carl was absolutely overjoyed that he was able to finally, at long last, able to make a personnel change with the winemaker/vineyard manager, who had worked at the company for more than fifty years. Carl had inherited the property from his father (and has been in charge since 1981), but apparently owing to some seemingly passive-aggressive provision of his father’s will, Carl, despite being the owner of the property, could not make this crucial personnel adjustment, a state of affairs that caused him no end of grief. My point is this: Things are never what they appear to be on the exterior. To the casual observer, Carl von Schubert is a member of the vinous pantheon, an Olympian demi-god, the owner of what I believe to be possibly the greatest wine estate in Germany, and further, incredibly lucky to work with the noblest white grape on the planet. In my fevered imagination, I reckon him to be the Thor, Zeus, or Odin of the grape universe, but a divinity afflicted with a titanic case of, say, hemorrhoids.3 I am so happy that Carl now feels so much freer; no question that the wines will become ever more exciting in the coming years. So, about this wine: It is, of course, utterly magnificent, a real pity to drink so young, but certainly capable of providing great vinous joy and satisfaction tonight. The “Superior” is slightly higher in alcohol than a typical fruity-style Spätlese or Auslese, as well as significantly drier; in some sense, it really is a new style for German Mosel wines—a middle ground between so-called classic “Spätlese/Auslese” and the trocken, or dry, style. What is typically most enchanting about the Grünhauser wines is their immense fruitiness, balanced by a steely acidity and mineral component. The ’06 seems to be relatively softer and more approachable in acidity, but the fruit—it is riotous. One aromatic element that is quite typical for G’haus is apricot and peach—flavors that one typically associates with botrytis. The other quality I often find is a haunting citrus note—mostly lemon (and sometimes lime); what you get in Grünhaus is not just lemon but lemon chiffon—that ethereal quality that makes you just wonder how it is that you are personally worthy enough to be consuming this juice. I really wanted to get the description of the wine right, so last night I thought to bring in another palate to help me with some of the heavier organoleptic lifting. My daughter, Melie, who is six, has heretofore humored me in my obsession with things gustatory. I have occasionally handed her a glass of wine, asking her, “So, Melie, what do you smell?” “It smells like wine, Dad,” she usually responds, rather amused at her own wit. But last night, something very unusual happened. Instead of responding in a dismissive, off-handed manner, Melie gave me very detailed tasting notes. 1. I’ve met Carl a number of other times on market visits to the US, where he has generally been a lot more relaxed. 2. I don’t know quite why we wine guys are always being asked the somewhat inane question about getting shipwrecked and what would then constitute our fantasy desert island wines. 3. I am also amazed by the fact that Carl imagines that a significant percentage of his wines (maybe more than half?) must be made in a dry or dryish style, a function of the dry wine mania that has swept through Germany in recent years. (In fairness, the quality of dry wines in the Mosel has dramatically improved in recent years.) Max Grünhäuser often seems to have perhaps a bit too much acid to work perfectly as a dry wine. But, as a Spätlese, I would reckon it to be perfect or perhaps even better than perfect. 4. We had actually made peach ice cream earlier that day, so the comparison was fresh in our minds. 5. Last year, Melie attended an unusual private school that teaches “circus arts” and has become a proficient stilt walker and unicyclist; she is still learning how to spin plates. 6. Nailing of this descriptor was particularly astute. Image courtesy of Carl von Schubert. Randall Grahm is the founder, winemaker, and self-styled "President-for-Life" of Bonny Doon Vineyard in Santa Cruz, CA. While he began his career in the wine business as the so-called Rhône Ranger, he is also known in some parts as the "Rhine Ranger," possibly due to his obsessive fixation on the Riesling grape. I wish all tasting notes of memorable wines would tell stories like this. After reading your comment, Lars, I put the 2012 Superior on my “Must Have” list. I checked: Chambers has it! Yes, John Ritchie at Chambers Street Wines ordered some 2012 Abtsberg Superior. Though I’m less a fan of “superior” bottlings, this is truly a fine wine. Don’t know what lemon chiffon is, but agree with his conclusion. Lars, a bottle of 2012 Superior bought per your recommendation is waiting to be tasted this weekend. Thanks, as always. Thanks for your comment, Daniel. I’m curious to hear your impressions of 2012 Abtsberg Superior. Had it last night. Wow-material. Unmistakable Grunhauser nose. Perfect balance, with an acidic bite that comes in the back to cleanse the palate and ask for the next spoon of lemon chiffon (I guess I get it now, without googling chiffon). Defines feinherb precisely — I had a US-imported bottle with that Dry-to-Sweet ruler on the back; the arrow pointed just right of trocken, lightly into medium dry territory; that stupid arrow doesn’t realize how sharp it was in this case.